I spent a nice little chunk of the last day of 2012 in the auditorium of the Eisenhower Executive Office Building waiting for President Barack Obama to enter the room and make a statement about the budget negotiations. Being in the 11th hour of the fiscal budget battle, this public engagement event had all the feel of a press conference but without the usual suspects of White House correspondents. Instead, a friendly group of citizens were invited based on stories submitted when the White House new media team asked “what would you do with $2,000” — the $2,000 we will pay in taxes if there is no budget agreement by midnight December 31, 2012. According to Macon Phillips, director of the White House Office for Digital Strategies, our stories were read, scored, and the high scores were sent up the ranks, et voila! there was an invitation email in my inbox. I was honored to be invited and I said as much in my RSVP. I’m old school. When you receive an invitation from the White House, you go. Cancel all appointments. What did I say to merit this invitation? The truth. $2,000 could purchase upgrades for my business. My home could use some attention. No doubt my healthcare payments will go up in 2013. Utilities. Food prices continue to go up. Everybody’s gotta eat. I could probably use $2,000 extra. And What did the President say? I don’t think the President would’ve made any statement about the fiscal negotiations unless he had a break through in his pocket which he did, and something to report. I did take notice it was a “gloves off” moment. You can read for yourself here. See it here. But the 2 hours leading up to President Obama’s statement, before the cameras entered the room, may have been just as important as the official word. It was great to hear about the process and priorities of the Digital Strategy Office and the Office of Public Engagement headed by Jon Carson. The Digital Strategy Office handles the White House email, social media, as well as the website pages on whitehouse.gov that include the “We the People: Your Voice in Government” petition page. Apparently for Macon he saw an opportunity for a connection with the President’s fiercest critics through this site that included a secession petition created after the President’s victory in November — over 150,000, exceeding the required 25,000 for an official response. It seems one of the goals and lessons of domestic issues communications is the first go-to for the President is the public just as it was in the campaign. Macon and Jon took time for a Q&A with we the invited people. A man in a walker asked why “middle class” is the focus of all policy and there is no talk about the poor or what the administraiton is doing for poor people, many of whom were instrumental in his re-election, especially the victory in Florida he pointed out. John Carson took this one mentioning the unemployment benefits in the negotiations as part of the budget’s aid to the poor. Is that all? It’s too bad during moments like these when a citizen is at the cusp of making a valid point and is so moved to make a lengthier statement when perhaps questions could be more enlightening for everyone. “To everything, there is a season” the bible says. As the man continued to talk, I noticed a number of the citizens in the room groaning. This was not a “Power to the P” moment. Another question came from a woman who said she was angry about the NRA recommendations for teachers to carry concealed weapons into classrooms a week after the Newtown, CT shootings at the Sandy Hook Elementary School. This citizen wanted to start a movement of mothers to push policy prohibiting guns in classrooms and schools. She had a great acronymn — MAGIC (Mothers Against Guns In Classrooms). Something tells me she also came prepared to be heard. Though not on today’s agenda, her message vibed with the room. Jon suggested teaming up, as the public engagement office does, with similar organizations to build a larger coalition. Ths is how public engagement works. Groups get together with groups. Apparently, the White House’s public engagement office does this when policy needs a partner to message with like the Sierra Club (example mentioned). There were no questions about foreign policy or global issues. Lunch break was cut short when we were informed the President was on his way to the auditorium. Reminder, there is only “President’s Time” — a special clock. Before the President’s statement, a reporter from the conservative publication “Human Events” asked me and another citizen on the back row how we felt about tax increases. Again, I told the truth. I really don’t know how I truely feel about anything until something is fact and I have the complete information. Was I giving a Buddhist answer? The quote got into the article and a second comment, more general, about no one liking taxes when the economy’s not robust. I then started chatting with the reporter about his years in DC and our common connections. Gave him a postcard for the Makes-Me-Wanna SHOUT! Pie Baking Challenge. Why not. 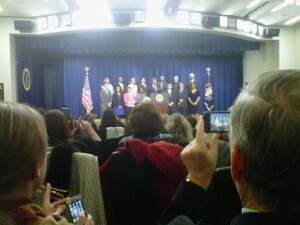 Obama’s handling of the fiscal cliff talks felt pitch perfect up until his Monday event with “middle class” citizens. The rally felt too much like a campaign rally — Obama was repeatedly cheered — and the president himself was in a joking mood that didn’t seem to fit the moment. Will it be overshadow the fact that he got a deal? No. But it was an off-key note from the country’s top communicator. Gee, I never thought I’d see myself in “” in print. “middle class” Thanks Chris for reducing me and my fellow citizens to the “so called” 93%. After chatting with a few people and looking around the room, I learned that we were mostly from the DC, Maryland, Virginia area (convenient for New Year’s Eve), retirees, self-employed, young professionals, perhaps students, former campaign workers. Is campaigning a new normal in governing and moving policy in a social media era? Years ago I was in the room with then Supreme Court Justice Sandra Day O’Conner who shared an interesting observation — no decision by the Supreme Court was made without substantial public interest and movement on the issue. The fact that the citizen press conference has gotten so much flack, says to me, this may have hit an important nerve — in the spirit of Macon’s petition example — connecting. Have we depended on our information handlers for too long? When we’re in a room together — all classes press included, can we be more than resource material? If this is the way the White House is rolling with press conferences on policy in play, I say “Do it again.” I’ll send something to the inbox. Yesterday, I had the pleasure and opportunity to see White House social secretary Desiree Rogers and deputy social secretary Joe Reinstein at a meeting of NATCAP, the national society of government meeting professionals inside the National Archives building in downtown Washington. I have to give NATCAP credit, so far there has been no press to my knowledge on this public appearance by Ms. Rogers. And it was a great opportunity to get a sense of her work and professional style. I can see how her staff and friends would enjoy her company and work tirelessly to back her up. The presentation was set up as a conversation/interview. Everything and everyone was relaxed and friendly. Both Rogers and her deputy secretary reflected on their first year — one year to the exact date when they were assigned to organize the viewing booth for President Obama’s inauguration. One of the challenges of working in official Washington is knowing the rules and protocol for official and even unofficial events from receiving lines, table seating, and yes, even parade stands. Apparently, no one left a seating chart for the next occupant, though past White House social secretaries left phone numbers for advice which Roger’s said she faithfully used. If you’re really into this, the U.S. military has something called a “Protocol Precedence List” which is a rank and file order from the executive office through the military. You can see a 2003 list here. Personally, I’m surprised there isn’t an Emily Post White House edition inside the White House for the basic things like seating, receiving lines etc. But when a new administration is coming into the offices of a previous administration, it probably takes 6 months just to find the stapler. The interview didn’t highlight “the thing” that happened in November, but Rogers was not shy to reference the media fall out with light humor and move on. The audience was with her on that note. Overall, she and her team organized 309 events in their first year, some scheduled in advance, many dropped in their laps like Presidential statements. Reinstein is in charge of talent for concerts etc. at the White House as well as some of the “holiday” or traditional celebratory events like the Easter Egg Roll, Cinco de Mayo etc. Rogers noted that no matter who’s in office, there are some traditions that will not be replaced, such as paper invitations from the Calligrapher’s office. Though this White House aims to go green, not all occasions are appropriate for the email or paperless invite. Rogers says with every tradition, the Obama White House likes to insert something new. Even if that means inserting a guest who likes classical into the country music concert. “How do you widen people’s perspective? How do you broaden that experience?” Rogers said. When she and the deputy secretary talked about the arts, that was when I really leaned into the conversation. Apparently each performer at the White House is asked to do a service activity whether it be a master class with young artists or something in the city. The challenge for WH events is to strike the right balance of mood, style, substance, access, and inspiration in these very trying times. Though Halloween was sited as their favorite event of the 1st year , I believe the right balance was achieved when Rogers and her team coordinated the recycling of the old tree ornaments left by previous administrations. That in addition to bringing in six trees that could be replanted. And I’ll say, if “the thing” hadn’t happened, the first state dinner would’ve been considered a crowning achievement. This is definitely a different kind of White House social secretary office. Though Rogers calls the White House, “the people’s house,” let’s face it, you just can’t get around the fact that what makes the White House and its events special to any and all is to be [officially] invited in. I used to be really into Halloween to the point of planning my costume well in advance. That meant taking out the sewing machine and actually making something to wear. Maybe because in those days I had somewhere to go and show off. 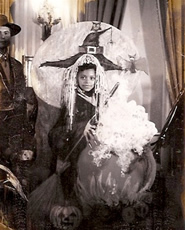 This may be hard to believe, but Halloween has always been a big deal in DC. My mom has stories about people dressing up and down to walk along U Street. In the late 70s, “The Rocky Horror Picture Show” was playing at a small movie theater in Georgetown. Georgetown is still the scene for the rambunctious young adult trick or treater. I didn’t do Georgetown. I saved it for a small town campus. 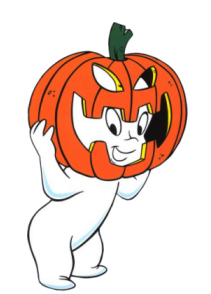 I did trick or treat up until age 8 or until we moved to a new neighborhood where we knew no one. This photo of one of my childhood friends was taken at the White House Halloween party thrown by President Richard Nixon in 1969. Tricia Nixon acted as hostess camping it up with “Dark Shadows” star Jonathan Frid who played the vampire hero Barnabas Collins. “Dark Shadows” was a 60s horror flick inspired soap opera on NBC. It ran for 5 years. Who’da thought? Jimmy Carter and George H.W. Bush threw Halloween parties during their presidencies. 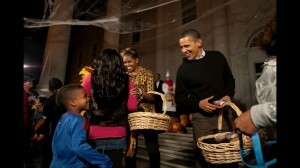 At this point it’s unclear if the Obamas will host a White House Halloween party after such a long hiatus and with so many other items on the “To Do” list. We’ve seen more than enough masks and costumes Photoshopped on the President during the summer courtesy of the loyal opposition. In a sermon I heard this Sunday, the Rev. Jackie Lewis, senior minister of Middle Collegiate Church in NYC, described a wacky faction of the American Christian community that is playing Barack Obama’s “Yes We Can” speech backwards in anticipation of hearing his declaration of being the anti-Christ. If they knew anything, they would know, any audio played backwards says “Paul Is Dead.” In fact last week was the 40th anniversary of the infamous Beatles rumor. Years ago, in an effort to put a more Christian spin on Halloween, there was an introduction of “Holy-ween.” The twist was to come dressed as bible characters vs. witches, ghosts, vampires, and Satan. The irony was, among bible characters, one could make a strong case for Satan to be at the Holy-ween party. The origins of Halloween, steeped in pagan traditions, seem to walk side-by-side with the holy and spirit life. It’s the night the two worlds – living and dead — are supposed to collide. If you bump into someone you knew, ask for a lottery number. I have to admit, this was a lot more fun when it wasn’t legal (meaning permits, corporate sponsors, and the Mayor showing up) and word of mouth brought out the crowds. The race has been a tradition of the LGBTQ community though most of the contestants are men. The Drag Races are the Tuesday before Halloween (October 27). The street is blocked off at 6 PM – gotta get there early because it’s packed. Race begins at 9 PM. Gather on 17th Street between P and S Streets near Dupont Circle. There are two street dances to Michael Jackson’s “Thriller” soundtrack and music video. The original dance was choreographed by Michael Peters. I had to put that out there because he’s been so neglected over the past months since MJ’s death. Peters, who choreographed “Thriller,” “Beat It” and other movies, music videos and Broadway shows, died from complications due to AIDS in 1994. This Saturday, October 24, Thrill the World DC will start rehearsing Thriller at 11 AM on Freedom Plaza (Downtown, Pennsylvania Ave.). The real dancing will start at 8:30 PM. Will they beat Mexico’s record for the most people dancing with Michael Jackson’s Thriller simultaneously? We’ll see. The event is also a fundraiser for Paralyzed American Veterans and Spinal Cord Research Foundation. Find out more here. There’s a fee: $20 for adults (18 and up); $10 for ages 8 and up. No zombie rate. The fee includes a workshop rehearsal. Then the dancing begins at 9:30 in front of the Atlas Performing Arts Center. You have to pre-register. Go to Joy of Motion’s website here. It costs nothing to watch. Don’t read too much into this as a Halloween thread, but hey, it’s on the same day as the Thrill the World DC Dance. Howard is known to have one of the best Homecoming celebrations in the country. People actually travel to DC for this. The parade, big game and step show are Saturday, October 24. Good luck getting tickets. More information here. Me? I’m making a caramel layer cake, and I’ve got tickets for the 2 week run of the Michael Jackson rehearsal doc “This Is It” for October 31st. I’m feeling the spirt. I happen to be browsing on the JackandJill Politics blog, and decided to take a look at this Politico widget – The White House calendar. As my schedule is too full sometimes to commit to my blog as I’d like, I thought I’d take an easy out, copy some code. 7:47 tonight the President and the Vice President are hosting a poetry jam. Hmmm. I know E-bert would like that one. In 2003, then First Lady Laura Bush wanted to give poetry its due until the poets led by publisher Sam Hamill wanted to give the White House its poetic due about the Iraq war. And then there was none. The event was called off. That was a beginning for Split This Rock/DC Poets Against the War (there’s also Hamill’s Poets Against the War). Their second poetry festival is coming up in 2010. Split This Rock is also collecting haiku poems for President Obama. Pencil one in. Yesterday, soon-to-be-former President George W. Bush hosted a gathering of the ex’s and the President-elect Barack Obama at the White House. Great topic for a photo op. Years ago, I read an article in Glamour magazine about body language in photographs. The author was a psychologist. She was on the money about the state of relations between celebrity couples based soley on their paparazzi shots (Demi Moore and Bruce Willis, Meg Ryan and Dennis Quaid). 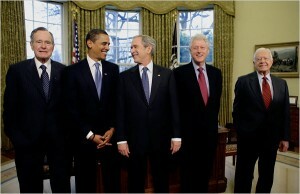 So why is former President Jimmy Carter so far away from the rest of the pack? I get that this isn’t exactly a Frank, Dean, Joey, Peter, and Sammy moment. Or maybe I’m reading too much into this, but then check out this AP video of the photo op moment when someone asks everone to get in closer. Speaking of Presidents…one of my things [that seems to surprise people] is that I read Presidential biographies. I’m tempted to pick up the Andrew Jackson biography. I’m intrigued. And I admit, I will browse Laura Bush’s memoir when it’s released. She just signed with Simon & Schuster and, I understand, got a $1.6 million advance. Apparently, the soon-to-be former First Lady had no problem shopping the project to publishers. Maybe one day she will be one of the featured authors at the National Book Festival that she co-founded with the Library of Cognress. We’re keeping our fingers and pages crossed that the Library of Congress will continue the annual event. Some Presidents may not have been favored in office, but make interesting reading. Any recommendations out there for great Presidential biographies? First Ladies (to date) included.